Researchers have devoted little attention to the effects of emigration from OECD countries, and the absence of detailed emigration data is the main culprit. Using a new and improved migration database, this column analyses the effect of migration on the wages of less educated native workers. The results suggest that, as far as labour market outcomes of less educated workers are concerned, governments should worry less about new arrivals and more about the potential consequences of their high emigration rates. The basis of the debate about migration into European countries is the perception that immigrants are unskilled and poor. Hence, the narrative goes, their arrival hurts the wages and employment prospects of less educated natives. At the same time, very little discussion is devoted to the patterns and economic consequences of emigration from European countries to other developed countries. The recent high-profile book by Collier (2013) is a typical example of this approach. Yet, the data indicate this might all be misguided. As Docquier and Marfouk (2006) and Grogger and Hanson (2012) have already pointed out, the profile of recent international migration patterns does not fit the stereotypes described above. First, a large portion of labour migration flows is from OECD countries to other OECD countries. Foreign-born residents comprised 7.7% of OECD countries’ population in 2000 and about 10% in 2010, and over half of those were from other OECD countries. Second, the share of college graduates among recent immigrants exceeds the college share among the native population in virtually all OECD countries. In some cases the share of college-educated among recent immigrants is four to five times as large as the college-educated share among natives. We address the critical question of the overall impact of these migration patterns on the labour markets of OECD destinations in a recent paper (Docquier et al. 2014) that is included in the September issue of the Economic Journal. In this paper, with the help of a simple macro model and recently collected, high quality data, we evaluate the effects of immigration and emigration flows during the 1990s and 2000s on native wages in 35 OECD countries (the club of rich nations). In our study we document the above migration patterns by using a new and improved database that provides bilateral migrant stocks for 1990 and 2000. The database is constructed by combining data from the national censuses of a large number of destination countries with imputed data (in the case of missing data) for a small percentage of migrants. The database measures migration stocks for both college-educated and non-college-educated workers between every pair of the 195 countries in the world. More details about its construction can be found in Artuc et al. (2015). We use it to construct net immigration and emigration net flows by education level for all OECD countries in the 1990s. The data clearly bring out the interesting patterns of skilled immigration in OECD countries. In all but a handful of cases, the share of college-educated within the net immigration flows is larger than the share of college-educated among natives. Even more interestingly, positive selection of migrants on skills and education also characterises emigration flows from OECD countries. The net emigration rates among the college-educated exceeded the rates among less educated in almost all of the OECD countries. Almost no attention has been devoted by researchers to investigating the effects of emigration from OECD countries, and the absence of detailed emigration data is the main culprit. In our paper, we calculate the effects of immigration and emigration on wages and employment of 35 OECD countries during the 1990s. Most interestingly, we focus on the effect of immigration on the wages of less educated natives – the group thought to be most harmed by new arrivals. We use our new dataset in a simple labour market model of demand and supply at the national level to determine wages in each country. The existing estimates of the labour market effects of immigration in the literature sometimes conflict with each other. A large part of the disagreement, however, is based on evidence from US labour markets, and limited to moderate differences in the wage impact of immigration on less educated workers. We take a different approach here. Our simple, but robust and widely used model of the aggregate country labour demand and labour supply captures the extent of the disagreement within the literature by simply using different estimates of the fundamental parameters of this model. In particular, we construct different scenarios by using different values for: (i) the elasticity of relative demand between college and non-college-educated; (ii) the elasticity of relative demand between native and immigrant workers; (iii) the strength of human capital externalities; and (iv) the elasticity of aggregate labour supply. 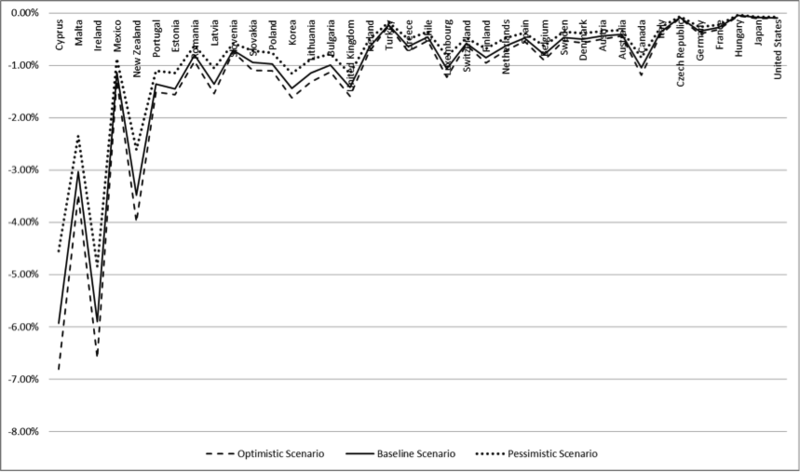 These different scenarios span what can be interpreted as pessimistic or optimistic views on the labour market effects of immigrants that emerged in the literature. Thus, without taking any stand on the current debate, we present the range of resulting effects, by varying the relevant parameter values within the reasonable spectrum established in the literature. Countries in the OECD had very different immigration rates (the size of the immigrant flow relative to the population) as well as different emigration rates (the size of emigrant flows relative to resident population). From 1990 to 2000, for instance, the immigration rate was 7.6% and 5.7% for Ireland and the US, respectively. At the other end of the spectrum Poland, Hungary, and Romania hardly had any immigration. Similarly, emigration rates ranged from 11% and 5% in Mexico and Estonia, respectively, to almost zero in the US. Different rates imply different economic effects, but the composition of immigrants and emigrants in terms of skills is just as important to determine their effects. Our findings are summarised in Figure 1, which presents the effect of immigrants on wages of less educated natives in each country, ranking them from left to right according to their immigration rate. 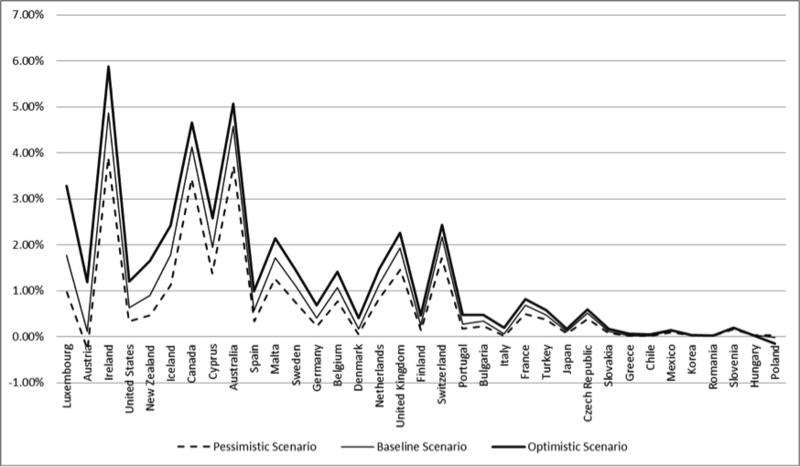 Immigration usually had a positive effect on the average wages of less educated workers in the 35 OECD countries, whether we assume the optimistic or the pessimistic scenario. This is due to higher education levels of the OECD immigrants relative to the non-migrant natives. Educated people are job-creating and complement less educated workers in productive activities. Hence, higher immigration leads to more job creation and higher demand for people further down the job ladder. Less educated workers experienced particularly large wage and employment gains in countries whose immigration systems favour educated immigrants, like Australia and Canada. In other countries like Luxembourg, Ireland, the UK, and Switzerland, less educated natives gained between 2% and 5% in their wages. Similar effects were found for selected countries over the period 2000–2007. Even more interesting are the economic effects of emigration in OECD countries, as there is hardly any analysis on the issue. Our findings are displayed in Figure 2, which shows the percentage effects of emigration 1990–2000 on the wages of less educated native workers, ranking those countries left to right according to the emigration rates of their college-educated workers. Those effects are quantitatively almost as large as (and of the opposite sign to) those from immigration. For example, in Cyprus, Ireland, and New Zealand during the 1990s, less educated workers suffered a wage decline of 3–6% due to emigration of their higher-skilled fellow citizens. The flight of highly skilled workers meant fewer job opportunities and lower demand for less educated ones – fewer entrepreneurs were left to employ manual workers, fewer households to demand cleaning, gardening, and personal services, and fewer engineers needing construction workers. So, the newly available and improved data on migrants by skill and a model capturing simple forces in the labour markets force us to re-think the widespread public perceptions about immigration into Europe. College-educated workers are much more mobile than less educated ones, and they move to countries where they are better paid. Hence immigration tends to reduce wage differentials between the lowest and the highest paid workers in receiving countries. Emigration does the opposite. As far as labour market outcomes of less educated workers are concerned, governments should worry less about new arrivals and more about the potential consequences of their high emigration rates. Artuc, E, F Docquier, C Ozden, and C Parsons (2015), “A Global Assessment of Human Capital Mobility”, World Development, forthcoming. Collier, P (2013), Exodus: How Migration is Changing Our World, Oxford: Oxford University Press. Docquier F, C Ozden, and G Peri (2014), “The Labour Market Effects of Immigration and Emigration in OECD Countries”, Economic Journal 124(579): 1106–1145. Docquier, F and A Marfouk (2006), “International migration by educational attainment (1990–2000)”, in C Ozden and M Schiff (eds. ), International Migration, Remittances and Development, New York: Palgrave Macmillan. Grogger, J and G Hanson (2011), “Income Maximization and the Selection and Sorting of International Migrants”, Journal of Development Economics 95(1): 42–57.